They’re going through a short period, but he’ll grow them out later. That’s what Chris said in a past comic. Er, in a COMMENT TO a past comic. These are older comics. NOte the date. Still…not even my best friend, who is a DDR freak and hates the sun as vampires do, even he isnt that white T_T OH SWEET MONKEY JESUS ON A POGOSTICK IT BURNS. i still have 34 years of badluck to work off from the two mirrors i broke when i was 5- and I’m 13! It could have been built on the side of a cliff. THE POWER OF THE PALE! Who has a bathroom that big? It looks like he’s in the cellar! 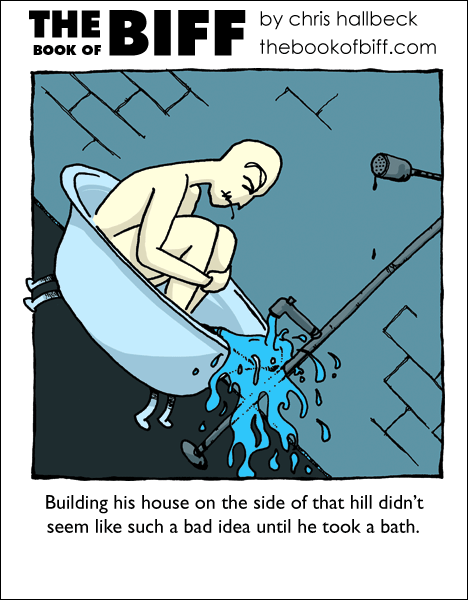 Yeah, bathtubs on hills are always too small. is he wearing plastic bags over his eyebrows so they don’t get wet? well, he has more of a tan than i do. also, since when do dungeons have indoor plumbing?